Despite improvements in hypertension awareness and treatment, 30%–60% of hypertensive patients do not achieve BP targets and subsequently remain at risk for target organ damage. This therapeutic gap is particularly important to nephrologists, who frequently encounter treatment-resistant hypertension in patients with CKD. Data are limited on how best to treat patients with CKD and resistant hypertension, because patients with CKD have historically been excluded from hypertension treatment trials. First, we propose a consistent definition of resistant hypertension as BP levels confirmed by both in-office and out-of-office measurements that exceed appropriate targets while the patient is receiving treatment with at least three antihypertensive medications, including a diuretic, at dosages optimized to provide maximum benefit in the absence of intolerable side effects. Second, we recommend that each patient undergo a standardized, stepwise evaluation to assess adherence to dietary and lifestyle modifications and antihypertensive medications to identify and reduce barriers and discontinue use of substances that may exacerbate hypertension. Patients in whom there is high clinical suspicion should be evaluated for potential secondary causes of hypertension. Evidence-based management of resistant hypertension is discussed with special considerations of the differences in approach to patients with and without CKD, including the specific roles of diuretics and mineralocorticoid receptor antagonists and the current place of emerging therapies, such as renal denervation and baroreceptor stimulation. We endorse use of such a systematic approach to improve recognition and care for this vulnerable patient group that is at high risk for future kidney and cardiovascular events. Global recognition of hypertension, the number of treated patients, and the proportion achieving recommended BP targets have improved over the past several decades (1,2). Nevertheless, many patients do not reach BP goals and are labeled as having resistant hypertension (rHTN) (3), which is particularly common among patients with CKD (4). Importantly, patients with uncontrolled hypertension are more likely to develop target organ damage, including progressive CKD and ESRD. Such patients are likely to be referred to a nephrologist for care, and treatment to achieve BP goals may be challenging. Early recognition of rHTN using a standardized definition and adoption of a consistent approach to evaluation and management may increase the chance of successful implementation of therapeutic approaches that combine medical treatment and lifestyle changes to prevent adverse outcomes. Accurate recognition and effective management of rHTN are problematic, because available consensus guidelines are inconsistent, even in their definitions of rHTN (3,5,6). First, varied definitions render it difficult to accurately estimate prevalence and associations with outcomes. Second, inappropriate labeling may discourage providers from performing evaluations to establish whether the patient’s hypertension is truly resistant, searching for reversible causes, and pursuing more effective combination therapies. The contribution of instituting appropriate lifestyle practices to achievement of BP control may be underestimated or considered too time consuming to address. Third, overdiagnosis of rHTN could lead to specialty referral of a large proportion of patients who could otherwise be cared for by primary providers and increase health care costs. This paper proposes a stepwise approach for the evaluation and identification of rHTN on the basis of the available literature and where direct evidence is lacking, observational data. Special considerations regarding the evaluation and management of rHTN in the patient with concomitant CKD are also reviewed. In 2008, the American Heart Association issued a scientific statement that defined rHTN as BP that remained above goal despite the concurrent use of three antihypertensive agents of different classes. The statement suggested that, ideally, one of three agents should be a diuretic and that all agents be prescribed at optimal dosages. In addition, patients whose BP was controlled but required four or more medications were also considered resistant to treatment (3). 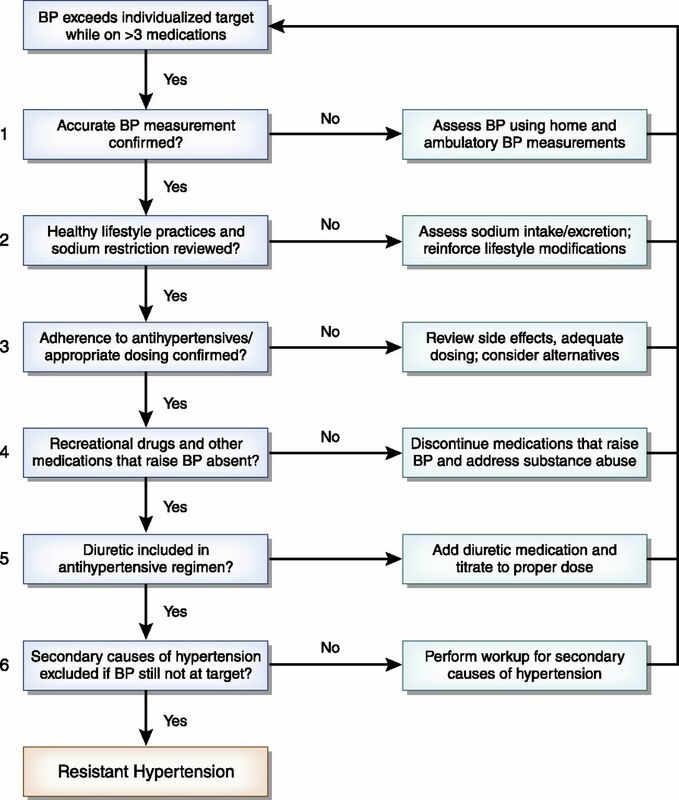 This definition did not address other relevant factors, such as ensuring accurate BP measurement, reinforcement of lifestyle modifications and antihypertensive medication adherence, adequate dosing and frequency, elimination of prescription and over the counter medications that may interfere with BP control, and exclusion of secondary causes (Table 1). In addition, the importance of out-of-office BP measurement as a part of hypertension evaluation has been increasingly recognized and deserves consideration (7). Assessment requirements as listed in Table 1 are necessary add ons to the definition to make a clear distinction between apparent rHTN, in which all of these requirements are not necessarily fulfilled, and true rHTN. In the latter case, a thorough and complete assessment is required. Epidemiologic studies report a highly variable prevalence for rHTN that ranges between 2% and 40% (1,4,7–15) depending on how rHTN was defined. Unfortunately, epidemiologic cohorts generally do not incorporate detailed information regarding medication dosing, treatment adherence, appropriate use of diuretics, and other clinical factors that may affect BP. Hence, the term apparent treatment-rHTN is used defined as BP not at goal (usually ≥140/90 mmHg) when the patient is prescribed three or more classes of antihypertensive medication or at goal after prescription of four or more classes. The variability in prevalence may also be related to differences in the populations studied, and it is higher in patients with CKD and cardiovascular disease (7,8,10). In the 2005–2008 US National Health and Nutrition Examination Survey, the prevalence of apparent treatment-rHTN was estimated to be 11.8% among individuals with hypertension (1), similar to what was reported from the Antihypertensive and Lipid-Lowering Treatment to Prevent Heart Attack Trial (ALLHAT), in which 12.7% of patients had apparent treatment-rHTN (12). However, a large retrospective review of 468,000 hypertensive patients reported a prevalence of 32%, but only one half of the patients categorized as resistant were prescribed optimal antihypertensive regimens (16). Data from a large health maintenance organization indicated that only 2.2% of patients with uncontrolled BP were taking diuretics and two or more classes of antihypertensive medications at maximal recommended doses, with 39.5% classified as having uncontrolled hypertension (4). These examples illustrate the importance of a consistent definition for rHTN that includes important factors, such as diuretic prescription and appropriate dosing. Consequently, the true prevalence of rHTN may be lower than reported. A prevalence rate in the range of 2%–10% in the general population and primary care settings is a reasonable estimate. The prevalence is substantially higher in patients with CKD, estimated to be 40% of hypertensive participants in the Chronic Renal Insufficiency Cohort (CRIC) Study. Approximately 50% had BP that was not at target on three or more medications, and the other one half had BP that was at target on four or more medications. Older age, men, black race, diabetes mellitus, and higher body mass index were independently associated with higher likelihood of having apparent treatment-rHTN (17). Similar findings were reported in a smaller study from The Netherlands (18). Despite differences in definitions, a consistent body of evidence supports the concept that rHTN is associated with an increased risk of adverse long–term cardiovascular and kidney outcomes (9,14,19). In the ALLHAT, participants with apparent treatment-rHTN were at higher risk for coronary heart disease (hazard ratio [HR], 1.44; 95% confidence interval [95% CI], 1.18 to 1.76), stroke (HR, 1.57; 95% CI, 1.18 to 2.08), all-cause mortality (HR, 1.30; 95% CI, 1.11 to 1.52), heart failure (HR, 1.88; 95% CI, 1.52 to 2.34), peripheral artery disease (HR, 1.23; 95% CI, 0.85 to 1.79), and ESRD (HR, 1.95; 95% CI, 1.11 to 3.41) compared with those without rHTN (12). In the CRIC Study, participants with CKD and apparent treatment-rHTN had a 38% higher risk of cardiovascular events or all-cause mortality and a 28% higher risk of ESRD or 50% decline in GFR (17). A systematic approach to evaluating the patient with suspected rHTN is illustrated in Figure 1. rHTN should be viewed as a diagnosis of exclusion. First, the accuracy of BP measurements using optimal technique needs to be established (20). Common pitfalls include improper patient positioning, wrong cuff size, poor timing of measurements, and equipment-related error. Ambulatory BP monitoring (ABPM) is an important component of the evaluation of a patient with rHTN to assess BP variability and diurnal and nocturnal patterns, and it can identify masked and white coat hypertension. The US Preventive Services Task Force recommends ABPM as the standard for confirmation of a hypertension diagnosis outside of the clinical setting (21). It is important to detect nondipping, defined as <10% nocturnal drop in BP, in assessing overall BP control and for prognostic significance (22). Importantly, nondipping occurs in 49%–82% of hypertensive patients with CKD and is associated with progression of CKD (23–25). When ABPM is not feasible, home BP monitoring may be substituted and has been shown to correlate closely with daytime ABPM readings (26), although it will not provide information about nocturnal patterns. Finally, automated office measurements can reduce the white coat effect but will miss masked hypertension. Thus, even in the setting of goal office measurements, it might be useful to pursue ABPM, such as when disproportionate target organ damage is present. The importance of accurate BP assessment was stressed in a recent statement by the American Society of Hypertension about rHTN (27). A systematic approach to the patient with suspected resistant hypertension. Second, nonadherence deserves special attention to identify and address adherence barriers effectively. One study screened patients’ urine samples with mass spectroscopy and found that only 47% of 76 patients with apparent rHTN were adherent to all prescribed medications, that 16% did not take any prescribed medications, and that 37% took <25% (28). In another study of newly referred, already treated, and thoroughly evaluated patients with rHTN, 10% were completely nonadherent, and 52% were partially or completely nonadherent (29). Nonadherence may be more common among hypertensive patients with CKD than those with normal kidney function (30,31). This is possibly related to the increased cost and complexity of medical regimens needed to treat CKD-related conditions or may be a contributing cause for CKD. Other causes of nonadherence include socioeconomic barriers, medication side effects, motivation, and cognitive dysfunction (32). Unfortunately, questionnaires have limited value in recognizing nonadherence in apparent rHTN (33). Tools to identify adherence problems include nonconfrontational face-to-face interview, review of pharmacy records for timing of prescription refills, pill counts, phone calls between office visits, use of a clinical pharmacist within the practice, or medication event monitoring systems that electronically document each time the patient opens a pill bottle. Although not readily available in most clinical settings, medication event monitoring systems were shown to be reliable indicators of and may improve adherence (34). In extreme cases, observed medication dosing in a controlled clinical setting may unmask nonadherence (35). A thorough approach to the patient with rHTN should include proactive assessment of barriers for adherence. Urine screens with mass spectroscopy for detection of antihypertensive medications can be considered if available. Third, other factors contributing to or exacerbating hypertension should be considered and addressed. These include lifestyle practices (excessive salt and alcohol intake, sedentary lifestyle, and lack of exercise) and use of recreational drugs and some prescription and nonprescription medications (including complementary and alternative medications) that exacerbate hypertension (Table 2) (3). Evaluation of salt intake and volume status is further discussed in Special Considerations in the Patient with CKD below. Fourth, the diagnosis of rHTN requires that the patient is treated with a diuretic. As detailed below (Pharmacologic Treatment and Special Considerations in the Patient with CKD), dose and dosing frequency should be critically considered. Fifth, workup for secondary hypertension should be considered (Table 3). The initial evaluation should include measurement of electrolytes, eGFR, urinalysis, urine protein assessment, and kidney imaging. In subjects with a family history of autosomal dominant polycystic kidney disease and normal serum creatinine, a renal ultrasound should be obtained. The addition of Duplex Doppler can provide quantitative information on renal artery velocities to improve detection of renovascular disease. Because several studies suggest that angioplasty alone may improve BP and even cure hypertension in young persons with fibromuscular dysplasia (36), a young patient with rHTN but without CKD should be further studied using renal artery imaging by computed tomography or conventional angiography on the basis of clinical suspicion. Presence and management of renovascular disease in patients with concomitant CKD are discussed further in Special Considerations in the Patient with CKD below. Obstructive sleep apnea (OSA) is a common cause of secondary hypertension. Screening tools, such as the Berlin questionnaire, can be useful (37) followed by overnight oximetry and polysomnography for confirmation. Several studies showed a high prevalence of OSA among patients with CKD ranging from 22% to 33%, and OSA is considered a contributing factor to rHTN (38). Treatment of OSA with continuous positive airway pressure (CPAP) was shown to reduce BP, although to a limited degree. In a trial of 40 patients with moderate to severe OSA and rHTN, a combination of CPAP and medical therapy versus medical therapy alone resulted in a significant improvement in BP at 6 months: mean daytime ambulatory BP decreased by 7/5 mmHg in the CPAP group and increased by 3/2 mmHg in the control group (39). However, BP reduction was not consistent across trials of CPAP treatment and is usually modest, with an average lowering of 3/2 mmHg reported in a recent meta-analysis of 29 trials (40). A combination of CPAP and weight loss may result in greater BP reduction (41). Several endocrine causes of secondary hypertension should be considered on the basis of clinical presentation. Although hyperaldosteronism is classically associated with metabolic alkalosis and hypokalemia, normokalemia should not preclude the diagnosis or deter further testing in patients with a high pretest probability (32). Measurement of the serum aldosterone concentration-to-plasma renin activity ratio, which had a sensitivity of 89% and a specificity of 71% in one study, can be useful as initial screening (42), even for patients taking antihypertensive medications, except for aldosterone receptor blockers, which should be stopped 4–6 weeks before testing. Testing for thyroid disease or pheochromocytoma should be considered on the basis of clinical suspicion (Table 3). After the stepwise evaluation as depicted in Figure 1 has been completed to confirm that the hypertension is actually resistant, the provider can formulate a therapeutic plan. Evidence-based studies are sparse regarding nonpharmacologic modification of lifestyle and diet as part of management for rHTN in patients with and without CKD (43). Several nonpharmacologic interventions have relatively well established efficacy in reducing BP in patients with prehypertension and primary hypertension. Use in treatment of rHTN is primarily extrapolated from these trials. The Dietary Approaches to Stop Hypertension (DASH) Study provides the best evidence for BP-lowering effectiveness of dietary sodium restriction and weight loss in those with prehypertension, with more pronounced effects in those with hypertension (44–49). A Cochrane review summarized the effects of modest weight loss (−4 kg over 6–36 months) by dietary intervention to reduce BP. However, hard outcomes were not studied in any of the included trials (50). Long–term outcome studies of weight loss by bariatric surgery using gastric banding revealed mixed results (51). In the Swedish Obese Subjects Study, after a transient lowering of BP in the first postoperative years, BP was similar in subjects who underwent surgery compared with controls (52,53). Data regarding gastric bypass surgery indicate better long–term outcomes. In a small series of hypertensive obese subjects, gastric bypass surgery was associated with persistent hypertension in only 20% after 10 years. Similar data were reported by the Longitudinal Assessment of Bariatric Surgery Consortium, a multicenter observational cohort study of ten United States hospitals in six geographically diverse locations (54). Three years after surgery, remission of hypertension occurred in 269 of 605 patients with hypertension at baseline who underwent Roux-en-Y gastric bypass surgery (38.2%) and 43 of247 patients with hypertension who received laparoscopic adjustable gastric banding (17.4%) (54). Of note, gastric bypass as opposed to gastric banding may also result in endocrine changes that affect BP regulation, such as an increase in atrial natriuretic peptide levels (55). Evidence is currently lacking whether such differences translate into different clinical responses in patient with rHTN with and without CKD. Accumulating evidence supports the beneficial effects of involving nurses and pharmacists in education, treatment, and monitoring of hypertension (56). A recent randomized, controlled trial of 110 diabetic subjects with uncontrolled hypertension revealed that home BP telemonitoring combined with automated support improved BP control over home BP monitoring alone, with 51% of intervention participants achieving BP target compared with 31% of controls (P<0.05) (57). A randomized trial of 401 participants with uncontrolled hypertension showed that an intervention using telemonitoring under primary care clinician supervision and optional patient decision support improved daytime ambulatory BP by 4.3/2 mmHg compared with usual care (58). Insight on the value of multiple simultaneous lifestyle interventions for rHTN is the subject of the TRIUMPH Trial (Clinicaltrials.gov no. NCT02342808) (59) to be completed in 2019, which evaluates the efficacy of a center–based lifestyle intervention using exercise training, sodium reduction, DASH diet, and weight management compared with standardized education and physician advice for improving BP control in patients with rHTN (59). Patients with CKD are included if the eGFR is >45 ml/min per 1.73 m2. Evidence is lacking regarding the BP-reducing efficacy of other individual nonpharmacologic interventions, including exercise, reduced alcohol intake, and nondietary, nonpharmacologic treatments referred to as alternative approaches (60) in patients with rHTN. Table 4 summarizes efficacious lifestyle modifications in hypertensive patients that are not specific to rHTN or CKD (47,61). To educate and engage patients about lifestyle changes, communication is key. Communication with patients about cardiovascular risk requires dedicated effort and recognition of barriers to achieving effective changes (62). Even in a research study setting, it is difficult for participants to maintain long–term lifestyle modifications (47). Developing effective public health strategies that can be feasibly implemented and lead to sustained lifestyle modifications remains a challenge (61). Because data about the effectiveness of weight loss, diet adaptations, and other nonpharmacologic interventions in rHTN are limited, the current knowledge gap could benefit from trials specifically aimed at lifestyle modifications in carefully selected patients with rHTN and CKD. Given the reported high nonadherence rates as assessed using mass spectroscopy in patients with apparent and confirmed rHTN (28,29), a comprehensive therapeutic strategy is needed. Such a strategy would aim to (1) assure that the prescribed medications are selected and dosed appropriately, (2) determine whether the instituted therapy causes a measurable BP response, and (3) verify the presence of and address barriers to adherence. Using primary hypertension treatment algorithms (63), a patient with rHTN would likely be treated with at least three antihypertensive agents of different classes, including a renin-angiotensin system blocker, a calcium antagonist, a diuretic, and possibly, a β-blocker. As will be described, there are data to support the addition of a mineralocorticoid receptor antagonist as an add-on fourth or fifth agent if a high aldosterone state has been confirmed by laboratory measurements. Optimization of intravascular volume status is essential in the management of the patient with rHTN (30), particularly in those with CKD (64). Inadequate volume control was reported even in patients being treated with diuretics (65). Brain–type and atrial natriuretic peptide levels were higher in 279 consecutive patients with rHTN (uncontrolled and using three or more antihypertensive medications) compared with 53 controls (normotensive or BP controlled by less than three antihypertensive medications). Interestingly, 85% of those with rHTN were being treated with a thiazide diuretic. Selection of a specific diuretic, titration of dose, and dosing frequency must each be considered for effective management of volume. For example, furosemide has a half-life of 30 minutes to 2 hours in patients with normal kidney function and would need to be dosed two to three times daily (66). Additional discussion regarding choice of diuretic and dosing in the setting of CKD is presented in Special Considerations in the Patient with CKD below. Plasma aldosterone levels, aldosterone-to-renin ratios, and 24-hour urine aldosterone levels are reported to be higher in those with rHTN compared with normotensive subjects and subjects with controlled hypertension (65). Moreover, a low dose of spironolactone decreased BP in patients with rHTN by 17/7, 24/10, and 26/11 mmHg at 1, 3, and 6 months after starting the drug, respectively (67). Two recent trials support the efficacy of mineralocorticoid inhibition in rHTN. The first confirmed the efficacy of 25 mg spironolactone (versus placebo) to decrease BP and reach the prespecified target systolic BP of <140 mmHg (73% versus 41% in spironolactone versus placebo groups) (68). The second compared the BP-lowering effect of the addition of spironolactone, doxazosin, bisoprolol, or placebo as add-on therapy to the participant’s baseline antihypertensive medications. Spironolactone (25–50 mg) was the most effective and reduced home systolic BP by 14 mmHg, about 9 mmHg more than placebo and 5–6 mmHg more than doxazosin or bisoprolol (69). One of 285 treated patients experienced a serum potassium concentration >6 mmol/L. These trials support mineralocorticoid inhibition with spironolactone as an effective addition to rHTN treatment. Eplerenone, as a more specific aldosterone receptor antagonist, remains a desirable alternative for patients with clinically significant side effects, such as gynecomastia or breast tenderness. Beyond optimizing diuretic dosage and addition of a mineralocorticoid antagonist, it may be necessary to add additional antihypertensive agents. Direct vasodilators, α-blockers, and central sympathetic agonists should be reserved for the most resistant or those intolerant of other agents due to more significant associated side effects. In addition to considerations already discussed for the patient with rHTN, special attention should be given to patients with rHTN and concomitant CKD with respect to the definition, stepwise evaluation, and particularly, differences in hypertension management. Whether the definition of rHTN in the setting of CKD should include more specific criteria has not been clearly delineated. For example, patients with CKD are more likely to present with sodium retention and excess volume among other features, such as unopposed activity of the renin-angiotensin-aldosterone system (RAAS). Therefore, optimization of volume status, including attention to diuretic selection and adequacy of dosage and dosing frequencies as well as consideration for use of RAAS inhibitors, should be addressed before a patient with CKD is labeled with true rHTN. Assessment of volume status and salt intake is particularly relevant in the patient with CKD, although formal measurements of salt excretion and volume using bioimpedance or labeled red blood cell techniques may be technically challenging or unavailable. Extracellular fluid volume expansion is prevalent and increases with the severity of CKD (71). In 338 patients with stages 3–5 CKD, 52% were fluid expanded as assessed by bioimpedance (72). Several small trials, including studies of patients with rHTN and CKD, suggest that measurement of hemodynamic parameters and volume status using thoracic bioimpedance may be an efficacious approach to guide medication selection and dosing (65,72–76). Until more data become available to support the standard use of such techniques in practice, reduction in salt intake and monitoring weight may serve as surrogates of volume status. Sodium intake can be estimated by 24-hour urinary sodium excretion for an individual in steady state or using a validated salt calculator, a survey of about 25 questions (77). Patients with CKD should be instructed to monitor their weight regularly. Secondary causes for hypertension are more common in patients with CKD and apparent rHTN. Although CKD per se could be responsible for rHTN (due to underlying renal parenchymal disease), the presence of CKD should not discourage investigation for other causes if clinical suspicion exists. OSA is frequent in the patient with CKD and particularly relevant in CKD, because fluid overload may contribute to swelling of the hypopharynx, palate, and nasal cavities and result in OSA exacerbation. Special consideration is required regarding renovascular hypertension. On the basis of the results of the benefit of STent placement and blood pressure and lipid-lowering for the prevention of progression of renal dysfunction caused by Atherosclerotic ostial stenosis of the Renal artery (STAR) Trial (78), the STent for Renal Artery Lesions (ASTRAL) Trial (79), and the Cardiovascular Outcomes in Renal Atherosclerotic Lesions (CORAL) (80) Trial, which suggested that renal angioplasty/stenting does not confer additional benefit above optimal medical therapy in patients with stable CKD, routine screening for atherosclerotic renal artery disease should be discouraged (78–80). The CORAL Trial emphasized the safety and efficacy of angiotensin receptor blockers in patients with unilateral or bilateral renal artery stenosis. Medical therapy in patients suspected of having underlying atherosclerotic renal artery disease should, therefore, include maximal tolerated doses of one of these agents before defining treatment resistance. In contrast, patients who fail optimal medical therapy, especially those with severe hypertension or recurrent episodes of acute (flash) pulmonary edema, refractory heart failure, recurrent AKI after treatment with angiotensin receptor blockers or angiotensin–converting enzyme inhibitors, or deterioration of kidney function, may benefit from percutaneous angioplasty and stenting, because such patients were excluded from the three trials (81). With respect to nonpharmacologic approaches for management, rHTN is more common and salt sensitivity of BP is well established in patients with CKD (43). The Kidney Disease Improving Global Outcomes guideline for management of BP in CKD advises limiting sodium intake to 2 g/d for hypertensive patients not on dialysis (82). Nevertheless, recommendations regarding sodium restriction in patients with CKD are on the basis of observational data, and interventional studies are needed to determine the optimal amount of sodium restriction in patients with CKD. One small randomized, controlled trial assessed sodium restriction for rHTN in 12 participants with CKD (83) in a 4-week crossover design. Sodium excretion rates were 252 and 46 mmol/d during the high– and low–sodium intake periods, respectively. The low–sodium intake phase was accompanied by a substantially lower systolic and diastolic BP (−23/9 mmHg) (83). In addition, caution and close monitoring should be used when considering the DASH diet for patients with advanced CKD or those being treated with RAAS inhibitors given the increased risk of hyperkalemia. Discussion of pharmacologic treatment of the patient with CKD and rHTN comes with several considerations. Because of decreased GFR, higher doses of diuretics are required in patients with CKD compared with those with normal kidney function (84). Regarding thiazide or thiazide-like diuretics, there is evidence that chlorthalidone is more potent in lowering BP, possibly because of a longer half-life, than hydrochlorothiazide (85). Moreover, recent meta-analyses reported that chlorthalidone and other thiazide–like diuretics were more efficacious in preventing cardiovascular events than hydrochlorothiazide and other thiazide–type diuretics (86,87). The longer half-life and duration of action of chlorthalidone may be particularly valuable in patients with variable medication adherence (88). Although there is a widespread belief that thiazides are not effective for patients with CKD and eGFR<30 ml/min per 1.73 m2, a recent study showed benefit (89). To date, hydrochlorothiazide remains the most commonly used thiazide, particularly in combination tablets. Taken together, although there are no head to head outcomes trials, it seems preferable to use chlorthalidone in the treatment of rHTN in patients with CKD. With advanced CKD (eGFR<20–30 ml/min per 1.73 m2), a loop diuretic can be effectively used to manage hypertension with consideration of dosing interval. Torsemide may be preferred, because it has greater and more consistent bioavailability and can be generally dosed once daily compared with furosemide or bumetanide, which would both require twice daily dosing. Diuretics in general and thiazides in particular are associated with hyperuricemia, but this should not discourage their use in patients with CKD given the frequent presence of hypervolemia. In rare situations, the combination of a thiazide and a loop diuretic to augment diuresis may be considered; however, this approach can cause extreme natriuresis and must be titrated and monitored carefully. A word of caution is needed about the application of mineralocorticoid inhibitors for patients with CKD; they are frequently already treated with an inhibitor of the renin-angiotensin system and would be more prone to develop hyperkalemia with a combination of medications targeting the RAAS. In recent years, several novel therapies were investigated as potential complimentary or alternative treatments to antihypertensive medications. Catheter–based sympathetic renal denervation (RDN) derives its pathophysiologic basis from the observation that bidirectional renal sympathetic nerve trafficking contributes significantly to BP regulation (90). Surgical sympathectomy was at one time one of the few therapies that could provide treatment for hypertension when drug therapy was not widely available (91). The renal artery can now be less invasively approached using radiofrequency ablation (92). In 2009, a small uncontrolled trial reported striking reductions of 22/11 and 27/17 mmHg in office BP 6 and 12 months, respectively, after application of this technique in 45 subjects with rHTN (92). Subsequently, a small nonblinded, randomized, controlled trial reported that RDN decreased BP by 25/10 mmHg after 12 months (93). The SIMPLICITY-3 Trial was the first sham treatment–controlled trial using this approach, but it failed to confirm earlier findings (94) Potential explanations included technique issues (operator related and catheter related) and trial design (better treatment adherence in both the control and intervention groups). Although a recent paper reported BP-lowering effect of RDN added to a stepped care approach using antihypertensive medications (compared with stepped care alone), there was no sham operation control (95). In the context of RDN, other techniques are now being developed with externally delivered focused ultrasound (96), which may offer safer adjunct treatment options. Although the negative SIMPLICITY-3 Trial substantially decreased interest in RDN, studies using RDN in patients with heart failure are ongoing and may provide more insight. Furthermore, favorable clinical effects reported for RDN, such as improvements in insulin sensitivity (97), microalbuminuria (98), and apnea/hypopnea index (99), may be offset by safety concerns, such as renal artery stenosis (100). Subsequent occurrence of reinnervation must also be considered. Larger studies with longer durations are needed to address these issues before RDN can be considered for clinical use. Another emerging technique is electrical carotid sinus baroreceptor stimulation using implantable devices. Such devices implanted chronically led to significant reductions in mean systolic BP of 26 and 35 mmHg after 6 and 12 months, respectively (101). Importantly, the safety end point was not met; issues were related to surgery (nerve damage and wound healing) and uncontrolled BP. Unfortunately, robust sham–controlled studies are not available. Moreover, carotid body stimulation has not been associated with the favorable metabolic effects observed for RDN. Of note, neither catheter–based sympathetic RDN nor electrical carotid sinus baroreceptor stimulation are Food and Drug Administration–approved therapies. The lack of consensus around a unified definition for rHTN has challenged efforts to define prevalence of the condition and outcomes. A systematic approach to evaluation will improve identification of factors contributing to poor control rates and facilitate efforts directed at better control through modifying these factors, which include but are not limited to nonadherence to lifestyle and dietary modification or medications, use of substances that may exacerbate high BP, suboptimal dosing of antihypertensives, lack of use or inadequate dosing of a diuretic as a cornerstone of management, and failure to perform appropriate diagnostic testing to exclude secondary causes. We propose that rHTN be defined more restrictively as a BP that exceeds the individualized BP target while the patient is receiving treatment with at least three antihypertensive medications, including a diuretic, at dosages optimized for maximum benefit with absence of intolerable side effects. In addition to office BP measurement, confirmation by above–target out-of-office measurements should be required. Treatment of rHTN includes attention to dietary and lifestyle modifications and adjustments to the antihypertensive regimen, including continued vigilance to adherence barriers and avoidance of substances that may cause high BP. For patients with CKD, drug class effect, dose escalation, optimization of dosing interval, and drug tolerability require additional attention, with special emphasis on volume assessment and treatment of hypervolemia. The role and safety of emerging novel therapies need additional exploration before their use in clinical practice. The authors thank all members of the American Society of Nephrology (ASN) Hypertension Advisory Group (George L. Bakris, Ellen D. Burgess, Lance D. Dworkin, Karen A. Griffin, James M. Luther, Julie Ingelfinger, Velvie A. Pogue, Jennifer S. Pollock, George Thomas, Peter N. Van Buren, and Matthew R. Weir) for their valuable advice and contributions. The ASN Hypertension Advisory Group would also like to thank Grant Olan, Senior Policy and Government Affairs Associate of the ASN, and Rosie Hernandez for their assistance during the preparation of this manuscript. Although this paper was written by members of the (former) ASN Hypertension Advisory Group and approved by the ASN Publications Committee, it is not an official ASN statement. This article contains supplemental material online at http://cjasn.asnjournals.org/lookup/suppl/doi:10.2215/CJN.06180616/-/DCSupplemental.